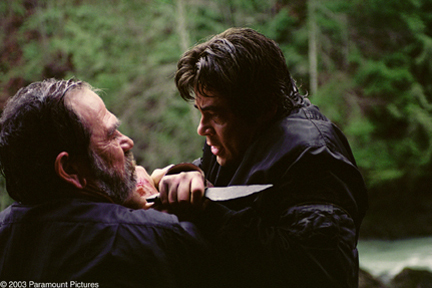 I like both of the guys in this, Benicio Del Toro and Tommy Lee Jones. And William Friedkin is an iconic director with films like THE EXORCIST. I remember thinking this was pretty good when I saw it around its release. I was up for an action flick, so it went in. I was really disappointed by this. It’s like they got two great actors with a great premise, and made three quarters of a script on a shoestring budget. IMDB lists this as a 55 million dollar film. I don’t buy it. Much of it feels TV quality, and I’ve seen better premises in episodes of 24. I’m trying to remember what it is I liked so much about the film in the first place which led me to purchase it. The stuff that takes place in the jungle, with Jones tracking del Toro is solid. I wish it stayed there. Instead, it goes to the city, where it can’t hold up. There are entire segments of this which feel contrived and forced. This would have been better as a two person movie, tracking through the woods. It’s really too bad. With these two guys and this director, there is a ton of potential here. THE HUNTED just can not live up to it at all. Tommy Lee Jones does some fine, nuanced acting. But it is just wasted. I don’t think this is one I’ll be coming back to any time soon. The negative bonus is for a terrible opening scene. Instead of invoking wartime terror, it feels cheaply shot on a set with extras and fake smoke. Instead of really putting the movie in the right place, it dooms it from the beginning. ~ by johnlink00 on June 7, 2011.